Hi Friends, I know it’s been a while. By now you’ve probably guessed that I’ve had my baby, a lovely girl whom we’ll call D. Though she has been a pretty mellow and relatively easy child (knock wood), the first two months were a period of adjustment. However now that we’re into month three, I’ve decided it’s time to venture back into the kitchen. This re-entry was prompted by the perusal through Food and Wine during a moment of quiet downtime. I was browsing through the magazine when I happened upon this lovely chicken recipe. If you’ve been following my blog at all, you know that I am a sucker for leeks. So that, plus the peas and generally healthy seeming quality of the dish, appealed to me. During the week, a lot of cooking doesn’t happen. H comes home work, hangs out with the baby and I either try to whip together a simple dinner, go to the gym or just collapse on the couch. The weekends are more manageable, which means Sunday night dinners are a good and probably attainable goal. Last Sunday night arrived and I read the recipe. “I have to use the oven? !” I exclaimed. Yes, it had been that long. Pathetic. I knew it was now or never. So, with D fully fed and H entertaining her, I got to chopping, simmering, baking and stirring. Let me tell you, it felt good. Once I passed my initial annoyance about the oven, the recipe was really simple. (Although I do admit that I skipped the part with the broiler.) The allotted baking period is especially good for feeding your child and/or cleaning the dishes, which allows you to multi-task. I also used a new ingredient – white balsamic vinegar. Truthfully, I’m not sure I tasted the difference between white and regular balsamic. I bet you can skip that purchase and just use the dark stuff you have in your cabinet. When I first described the recipe to H, who nicely agreed to eat my experiment for dinner, I said the dish reminded me of French or Italian cooking. But once I ate this supper, Indian cuisine immediately came to mind. 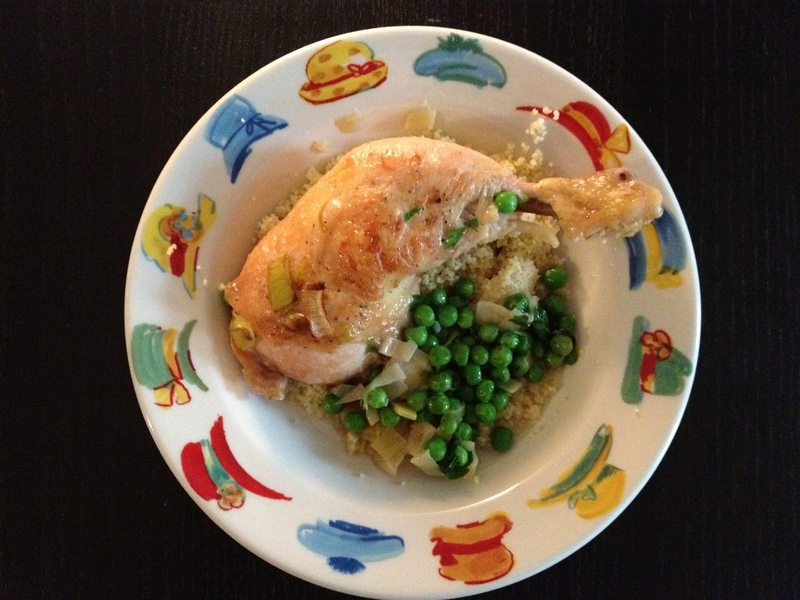 Something about the combination of tarragon and peas, paired with couscous, brought me back to those out-on-the-town Indian suppers that H and I used to enjoy. Nevertheless, this dish was hearty, delicious and pretty light. We even had enough for leftovers, which I’m sure will make any new mama happy. Now that I’m back in the apron (at least on Sundays), I hope to see you around these parts a little more often. In the meantime, enjoy!